Note: use percentage for table width (i.e., 90%, etc.) instead of pixels. A percentage setting will allow the table to adjust for different device screen sizes (i.e., desktop, tablet, and cell phone). Also, using 2 for cell padding and spacing will allow content more room in cells. Enter table title into Caption box. Describe table data in Summary box. Example: the following table presents information on department staff by name, position, extension, and email. First row table headers are the most common (i.e., headings appear at top of each column). 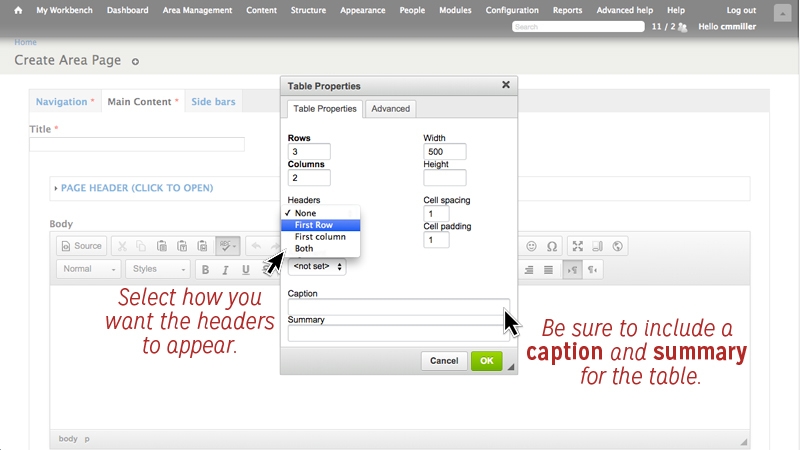 Caption, Summary, and Header are all required settings for accessibility purposes.